After receiving applause and encomiums for announcing a move to get private operators to revamp the dilapidated Mile 2 jetty “anytime next week,” three months later, nobody has lifted a finger on the project, Premium Times can report. At the forum, Mr. Kalejaiye noted that Governor Akinwunmi Ambode had approved the conversion of the jetty into a world-class facility, adding that it was going to have a shopping mall, a cinema and other live activities therein. “We are going to have a modern jetty there and then it is also going to have the headquarters of Lagos Ferry Services,” Mr. Kalejaiye had said. “These are good things, it is in the pipeline but I can tell you that we have completed all the necessary soil test, the surveys, the town planning, we have asphalted the place. We would have commenced work there but we have to tarry so that we can get all the necessary approvals. I can tell you now that we are set to commence monumental structure in Mile 2. When Premium Times visited the facility on Thursday, the jetty continued on its trajectory of disrepair. There was no visible sign of work as overgrown weeds and smell of overnight faeces welcome visitors into the promised modern structure. 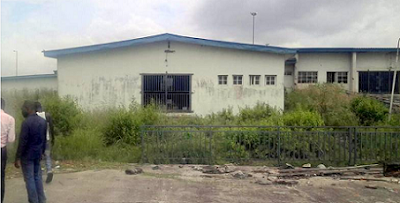 The security officers manning the facility declined to answer questions posed by our reporter but directed him to a man named James Adeyemi who identified himself as the Yard Manager, representing Crownsworth Marine Development Company Ltd, the concessionaire of the facility. According to Mr. Adeyemi, the work had been on hold due to lack of fund. He said the bank to sponsor the project was yet to honour the agreement signed. “The problem is between us and the bank,” Mr. Adeyemi began. “Initially, before they concessioned this place, there was an agreement already between my company and the bank. On how soon work will commence, Mr James said, “with the look of things, because anytime I speak with my boss, he always laments on the bank’s delay. When Premium Times contacted the Lagos official, Mr. Kalejaiye, on the slow pace of the planned world-class jetty, rather than reply to questions, he was furious over how we gained access into the facility. He declined any further discussion. » Refinery Blast At The Port Harcourt Refinery Jetty Claims 7 Lives.